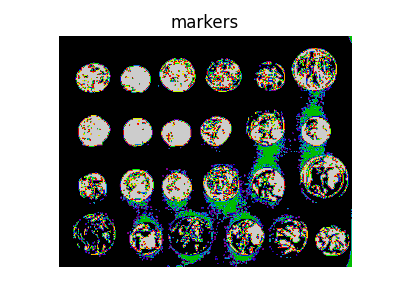 Image segmentation is the task of labeling the pixels of objects of interest in an image. In this tutorial, we will see how to segment objects from a background. We use the coins image from skimage.data. This image shows several coins outlined against a darker background. The segmentation of the coins cannot be done directly from the histogram of grey values, because the background shares enough grey levels with the coins that a thresholding segmentation is not sufficient. Simply thresholding the image leads either to missing significant parts of the coins, or to merging parts of the background with the coins. This is due to the inhomogeneous lighting of the image. A first idea is to take advantage of the local contrast, that is, to use the gradients rather than the grey values. As the background is very smooth, almost all edges are found at the boundary of the coins, or inside the coins. 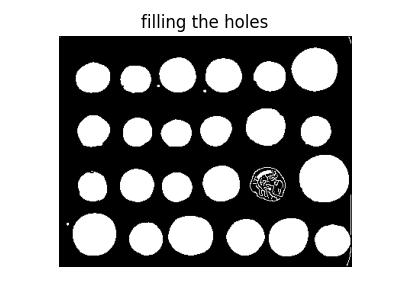 Now that we have contours that delineate the outer boundary of the coins, we fill the inner part of the coins using the ndi.binary_fill_holes function, which uses mathematical morphology to fill the holes. Most coins are well segmented out of the background. 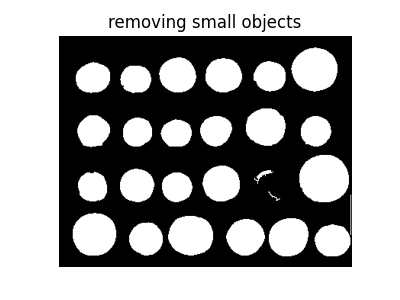 Small objects from the background can be easily removed using the ndi.label function to remove objects smaller than a small threshold. 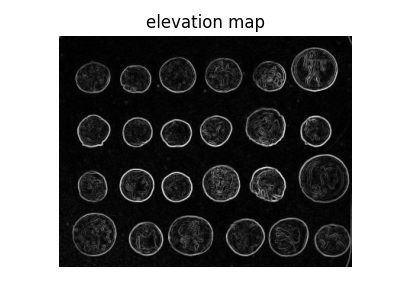 However, the segmentation is not very satisfying, since one of the coins has not been segmented correctly at all. 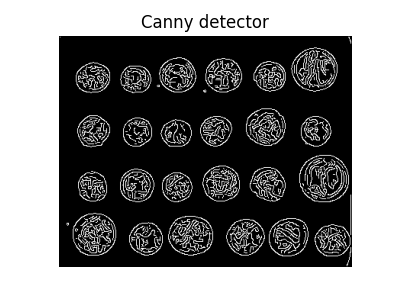 The reason is that the contour that we got from the Canny detector was not completely closed, therefore the filling function did not fill the inner part of the coin. 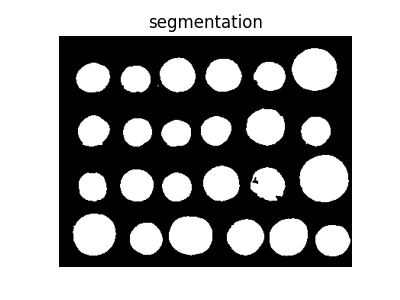 Therefore, this segmentation method is not very robust: if we miss a single pixel of the contour of the object, we will not be able to fill it. Of course, we could try to dilate the contours in order to close them. However, it is preferable to try a more robust method. We will use these markers in a watershed segmentation. The name watershed comes from an analogy with hydrology. The watershed transform floods an image of elevation starting from markers, in order to determine the catchment basins of these markers. Watershed lines separate these catchment basins, and correspond to the desired segmentation. 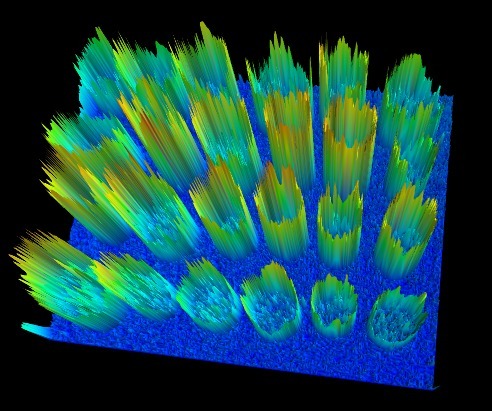 From the 3-D surface plot shown below, we see that high barriers effectively separate the coins from the background. With this method, the result is satisfying for all coins. Even if the markers for the background were not well distributed, the barriers in the elevation map were high enough for these markers to flood the entire background.